What is the future you want? Even seasoned investors have questions about their financial health. Am I diversified enough? How will my investment decisions affect my taxes? What should I consider when passing my money on to my kids? We have one of the first Certified Financial Planner™ professionals, in Salem, Larry Glaze; a business valuation expert, Mike Blanchard; and they are both tax-savvy CPAs as well. That means we consider personal and business perspectives—especially if you’re a business owner—as well as your best position for tax management. Our primary goal as your personal financial planning advisors is to examine every angle to make sure you’re on the right track. We’ll help you consider all of the scenarios and opportunities. We’ll provide practical advice. And we can support you in growing your nest egg, planning for retirement, or providing a retirement program that works for you and your employees. Are you wondering about maximizing your government benefits? Whether Oregon PERS or Social Security, we’ll plan with you to get the most from your benefits. Are you considering a retirement plan for you and your employees? We can help you choose the right plan that will maximize your retirement benefits and provide for your employees. 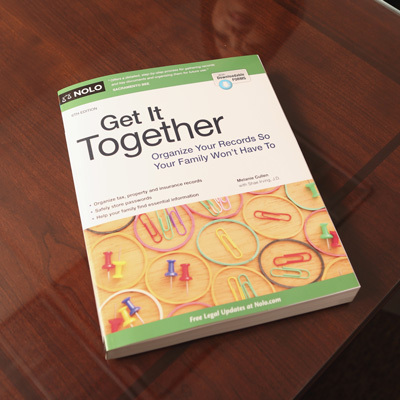 We recommend this outstanding book, Get It Together, to help our clients organize critical financial and personal records. This tool offers downloadable forms that will help you gather the details of your financial life all in one place. If you're interested, find out more on the publisher's website and more associated tools on the Get it Together website! Or join our ongoing journey toward peace of mind using the Get It Together book as we write about it on our blog. By having your records organized, you’ll be able to see the whole picture and all of the details. Your financial planner—whether Larry or Mike—will also better understand your resources, assets and goals. We’ll work with you to organize your records and create your personal financial plan. Or more comprehensive plans for your financial life and future. Personalized reports and professional recommendations in many areas including estate, insurance, budget, etc. Fee: Typically $1000 to $2500 depending on complexity. Discounted for asset management clients. When you’re ready, use the link below to schedule an appointment. Bring these items to your first meeting with one of our advisors. Life, disability, and long-term care insurance information. We look forward to working with you to create the future you envision.